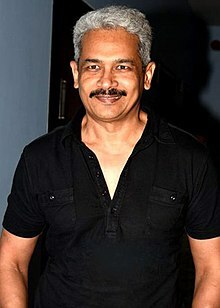 Atul Kulkarni (born 10 September 1965) is an Indian film actor who has acted in multi -language cinemas. Kulkarni was born on 10 September 1965 in Belagavi, Karnataka, India. He completed his secondary education from Haribhai Deokaran High School, Solapur, Maharashtra. He completed his Junior College from Belgaum and completed his graduation in English literature at D. A. V. College, Solapur. Kulkarni received his diploma in acting from National school of Drama in 1995. He is married to theater actress Geetanjali Kulkarni, whom he met at National School of Drama. Kulkarni's first stint with stage was during his high school days. He participated in the Maharashtra State Drama Competition regularly. Between 1989 and 1992, he won awards for Acting and also for Drama-Direction. Atul enacted in Gandhi Viruddh Gandhi, the play made later famous by Dilip Prabhavalkar in Marathi professional theatre circuit until mid-90's. Later during his college days he actively participated in cultural gatherings. While studying, Atul joined Natya Aradhana, an amateur theatre group from Solapur. Atul Kulkarni holds a postgraduate diploma in dramatic arts from National School of Drama, New Delhi. ^ "Theatre actor Geetanjali Kulkarni gets 'stamp' for film journey". The Times of India. 5 April 2015. Retrieved 3 August 2015. ^ "NSD-GRADUATES1" (PDF). nsd.gov.in. Archived from the original (PDF) on |archive-url= requires |archive-date= (help). ^ "www.atulkulkarni.com/". "www.atulkulkarni.com". 3 April 2018. Retrieved 30 May 2018. ^ "19970630-gandhi-virudh-gandhi-to-be-staged-at-tejpal-auditorium-mumbai-832641-1997-06-30". "www.indiatoday.in". 3 April 2018. Retrieved 30 May 2018. ^ "genesis". "www.quest.org.in". 3 April 2018. Retrieved 30 May 2018. ^ "ganeet_lekh". "www.quest.org.in". 3 April 2018. Retrieved 30 May 2018. ^ "Actor-Atul-Kulkarni-visits". "www.snehalaya.org". 3 April 2018. Retrieved 30 May 2018. ^ "article17430551.ece". "www.thehindu.com". 3 April 2018. Retrieved 30 May 2018. ^ Sharanya CR (21 July 2013). "Atul Kulkarni wears a Kannada attire for his Filmfare award". The Times of India. Retrieved 3 August 2015. ^ G Dhananjayan (2014). Pride Of Tamil Cinema: 1931 To 2013. Blue Ocean Publishers. p. 546. Wikimedia Commons has media related to Atul Kulkarni.